When you use the right vinyl, graphics can be easily removed. Using a heat gun and plastic razor to lift the edges, fresh vinyl will peel off with little or no residue. If your graphics are only a couple years old and still quite glossy, you should try peeling it yourself on a warm sunny day. If you wait until the end of your vinyl’s lifespan, the adhesive will become less removable. Besides more elbow grease needed, there will be residue left behind, but that comes off with non-toxic sprays like RapidRemover orange peel adhesive remover. We charge $85 per hour (min. 1 hour) to remove vinyl graphics. We’re happy to give out free plastic razors if you’d like to remove your own graphics. 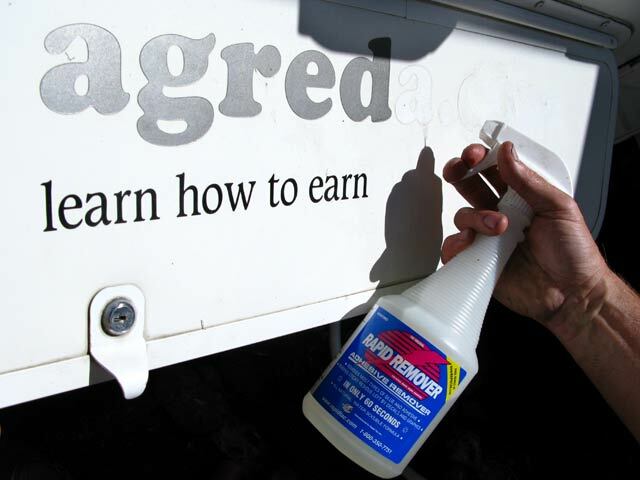 Use a heat gun to warm the vinyl, and help the peeling come off in large pieces versus small flakes. Sadly once your vinyl has a dusty or cracked appearance, the adhesive has become more permanent, and may require an eraser wheel to gently grind off. 3M makes a soft wheel that’s formulated to only affect the top vinyl layer, but the paint behind really old vinyl is probably sun damaged, and we only use the wheel as a very last resort – with a full release waiver – since we have no way of knowing the paint’s original condition before it was wrapped.